...but it's been discovered because it's such a charming area to visit. These villages weren't undiscovered the first time we visited, but we felt like we had discovered them because they are small towns. And you travel to mingle with the locals, don't you? 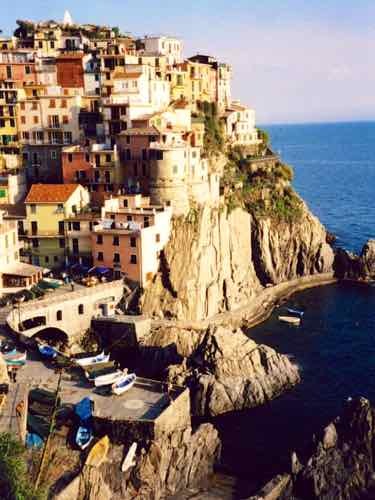 We stayed in Manarola on that first visit. A glass of wine overlooking that cute little harbor, and we were hooked. It DOES take a little more effort to get there than to some other areas of Italy. There are different ways to visit these coastal charmers. Or you can drive to the area... that's what we did. Of course, if you drive, you must leave your car at a car park high above each village and hike down to it... with your luggage, remember! There are some hotels and many rooms for rent in houses. We hiked into two villages before we found a room in Manarola the first time. Our second visit was another two village hike before we found a room in Riomaggiore. Better to arrange your accommodations ahead. 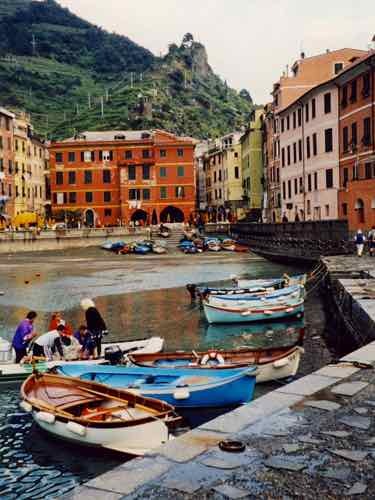 The attraction of the Cinque Terre is the pretty villages themselves. Pastel colored houses jostle each other for space on the steep slopes and spill down to the sea. Narrow streets and alleys twist and turn at unexpected angles. Small fishing boats sit on the streets where you would expect cars to be. Any one of the towns is a great place to stay. They are all traditional fishing villages, but there are terraces above and around each village filled with vineyards, and olive and lemon groves. Enjoy some local food and wine. There is a white wine grown in the terraced vineyards called Cinque Terre. Pair it with anchovies which are a local specialty (and will be better than you expect because they are fresh) or with a pasta dish topped with pesto. This area is the birthplace of pesto, and it doesn't get any better. Top your meal off with another local specialty -- a dessert wine called Sciacchetra. 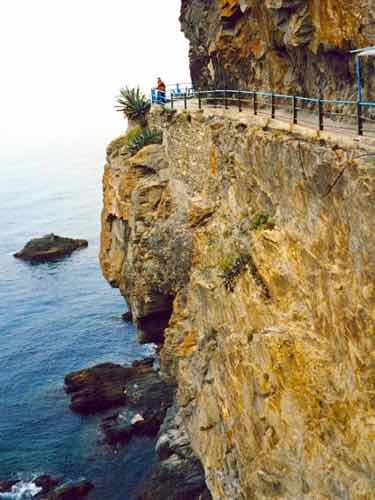 There is a popular hike that links the five villages called the Sentiero Azzurro (the Blue Path). 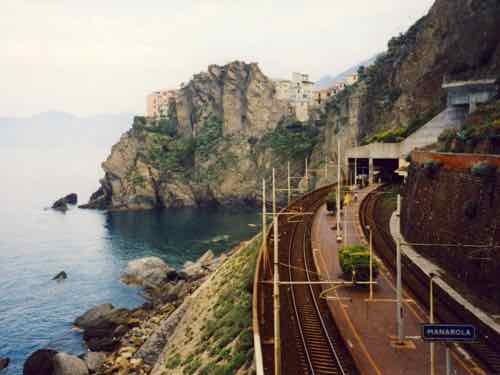 It is a shore-hugging path that runs for 7 miles (11.3 km) from the southern most village of Riomaggiore to the northern most, Monterossa. You can do this in a day if you are in good shape. The best time to go is in the spring when it isn't too hot. If you don't want to hike between all of them, you can do shorter hikes. Consider the Via dell' Amore (Lovers' Way) between Romaggiore and Manorola. You can easily make it both ways in an easy morning of hiking. (There is a nominal fee charged to walk this part of the trail. This section is paved, and the the fee helps with maintenance). Or catch one of the ferries that run from village to village in the spring and summer. Whether you drive to one, hike to all five or view them from the sea, you'll come away from the lively villages of the Cinque Terre with a smile on your face.